Hello everyone, and welcome to another edition of the Tiggerific Tuesday Trivia blog hop! Along with my friends Jodi from Magical Mouse Schoolhouse, Jenn from Disney Babies Blog, and Heidi from Heidi’s Head, I’m Mike, here to share a little bit of Disney Trivia with you! Do you have a blog and a trivia tidbit to share with us? If you do, then why not add it into the hop? You can do so at the link at the bottom of this post! Q: About how many miles do the monorail tracks cover? This seems like an easy question, but what do I know? My guess — and trust me, this is a guess, I haven’t looked in the back of the book for the answer yet, is A. 14.7. Am I right or wrong? From early morning until long after the theme parks close, the WDW monorail system transports Guests between the transportation hub and three resort hotels as well as between the Magic Kingdom and Epcot. If you add up all the trips the monorails have made over the 14.7 mile (23.7 km) track since 1971, the mileage logged would be equal to more then 25 round trips to the moon — even taking into consideration that the original monorail route was a bit shorter (it was expanded in 1981 in preparation for the opening of Epcot). The original fleet was retired and replaced in 1990. 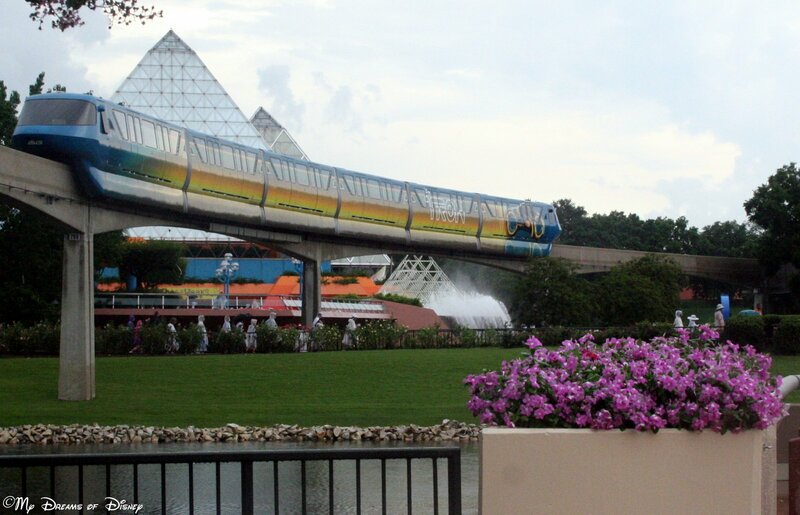 Of course, the monorail has gone through some changes over the years, with perhaps the most striking change coming when they closed down the monorail earlier in the evening so that maintenance could be done on the units nightly. This created quite an uproar, but to a large extent, I believe that has died down some. Thank you for stopping by! Go check out the rest of the entries below! Attraction Series – Space Mountain! Space Mountain is a unique attraction at Walt Disney World in that the attraction opened first at the Magic Kingdom in Florida, and then was installed at other Disney parks across the world! 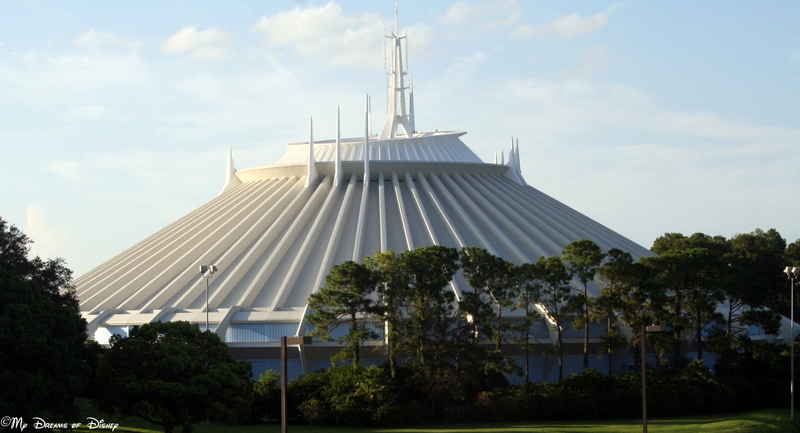 Space Mountain opened on January 15, 1975 in Tomorrowland. Did you know that Space Mountain is considered to be built “outside” the park in that it is on the other side of the Walt Disney World Railroad tracks that serve as the perimeter of the park? Also, did you know that upon opening, the first sponsor of the attraction was RCA? Card Walker, the CEO of Walt Disney Productions, convinced RCA chairman Robert Sarnoff to sponsor the attraction. RCA had won the contract to provide the communications hardware for the resort, and their was a stipulation that if a big attraction was opened, RCA would contribute $10 Million dollars to sponsor it. After Space Mountain opened and was a big success, it was opened in modified forms at Disneyland (May 27, 1977), Tokyo Disneyland (opening day, April 15, 1983), Disneyland Paris (June 1, 1995), and Hong Kong Disneyland (opening day, September 12, 2005). So, in all of the versions, the one at the Magic Kingdom in WDW is the slowest. I don’t know about you, but I would love to try out the Disneyland Paris version at 47 MPH! I hope you have enjoyed this look at Space Mountain! Until our trip last June, Space Mountain was one of those take it or leave it rides for me because Sophie doesn’t like it, and it seems so slow. But last year I rode it twice during our visit, the first time I though it was insane, but the second time I thought it was even faster! Thanks for stopping by! 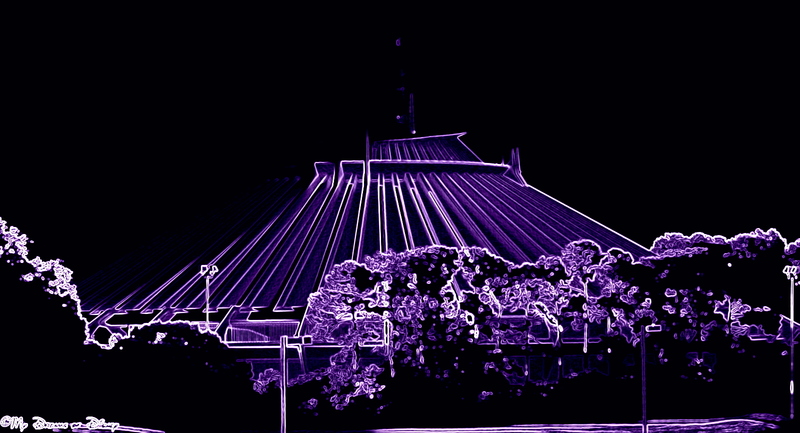 In closing, here is a picture I played around with a little bit — imagine if Space Mountain looked like this!